Jason Mraz had us at ‘hello’. Of course, ‘hello’ for us was Jason’s 2003 single ‘The Remedy (I Won’t Worry)’, which hit the top 20 over in the United States, but failed to crack the top 50 here in Australia. We remember being utterly mesmerized by a Warner boardroom performance in front of a select group of media types which featured just Jason, his voice, a guitar and Toca Rivera on bongos. We were hooked. Nine years on, Jason’s almost a household name here in Australia, thanks to his triple platinum 2008 single ‘I’m Yours’ and the double platinum album it came from; ‘We Sing, We Dance, We Steal Things’. Now he’s back with a new single from a forthcoming (as yet untitled) fourth album. 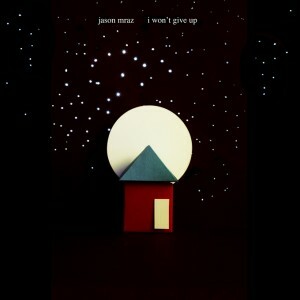 ‘I Won’t Give Up’ (cover art pictured) was leaked to his Youtube page two weeks back and has since notched up close to five million views. Though the track was only sent to radio here in Australia officially today, it’s been finding a home in the ARIA singles chart for the past two weeks; this week improving 17 places on its No.88 debut. And if ‘I Won’t Give Up’ is any indication of what to expect when the new album drops, presumably later this year, we’re clearly in for something very, very special.